Flowtown is the missing link in social media marketing. From a Silicon Valley start-up introduced to me by my friend Francine Hardaway, Flowtown is a terrific new tool that is already helping some 20,000 businesses turn email lists into engaged contacts in social media. .
Upload your mailing or CRM list (up to 10,000 names) to Flowtown and it’ll show you all of your contacts’ social networks. Because it’s integrated with Klout, Flowtown helps you identify which of your contacts is a social media influencer, and lets you connect with them from within the interface. Tweepsearch and Follower Wonk are two tools I use to search Twitter for influencers. Both let you enter keywords and then find the bios that contain those terms. So if you are looking for financial analysts, hikers, photographers, or anything else, you find all the ones who are passionate enough about the topic to use those words in their bios. TweetBeep is like Google alerts, but for Twitter. You sign up to get hourly updates on Tweets that mention you or any names, keywords, or terms you choose. There are free and $20 a month versions. I’ve been finding Kikin really valuable since I installed it in my Firefox toolbar recently. Kikin augments Google searches with relevant information from one’s social media contacts. So, if I’m shopping, I can get opinions from people I follow, see reviews, check competitive prices and lots more, without even leaving the product page. If you’re searching Google to find Labradoodle Puppies on Google, Kikin will provide a pane of YouTube videos of Labradoodle and show you the Tweets that mention them. You can arrange to see only the Tweets of people you follow. You can re-Tweet from the Kikin interface. 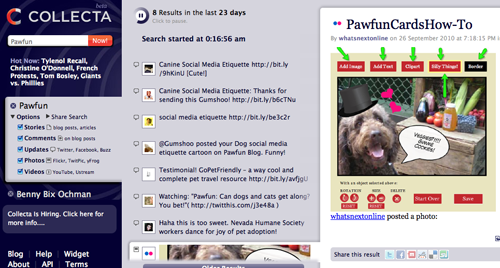 You also can search your Facebook news, and elect to only see results from YouTube and Twitter. Collecta.com www.collecta.com is a remarkably useful new metasearch for the social web. You can do a real-time search of the major social networking sites that includes results from blogs, articles, Twitter, Facebook, Flickr, YouTube and many more. Results can be filtered by articles, photos, videos, and comments written on blogs or articles. Collecta, unlike other search engines, remembers your searches for future use. Searches take about 10 seconds to begin returning results and Collecta continues to update in real time for as long as the site is open. What are your favorite tools for searching social media?